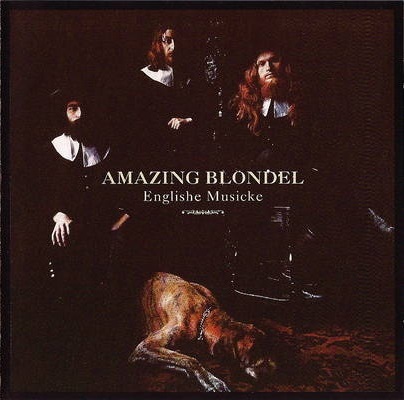 Amazing Blondel existed throughout the early 70s, originally formed by John Gladwin and Terry Wincott after leaving another even more obscure band called Methuselah. This compilation is drawn from their second, third and fourth albums (they produced a total of nine between '70 and '77.) For these three, the band was a three piece, singing and playing krumhorns, recorders, lute, theorbo, guitars, dulcimers, flute, piano, harpsichord, Mellotron, organ, tabor, cittern tubular bells, glockenspiel and percussion. From this instrument list and the fact that (at this point in time) they were drummer-less, you might be getting the idea that this was some sort of medieval-meets-modern folk trio, which is absolutely correct. Musically his is very close to Gryphon circa Midnight Mushrumps, while the vocals may remind a bit more of Peter, Paul and Mary. Very nice stuff, this is. The first eight tracks are drawn from their third (Fantasia Lindum) and fourth (England) albums, and represent the most musically sophisticated of the material here, which any prog fan without an aversion to folk music should have no trouble enjoying. Included are the incredible twenty minute title track of Fantasia Lindum, "A Spring Air," "Dolor Dulcis," and two extracts from "The Paintings" on England. After the 43 minute mark, the compilation begins to draw from their more simple second album Evensong – still excellent, but not quite as powerful musically. Still, I think most fans of early Gryphon, Fairport, and other British folk-rock will be delighted with this one.